Radon is a type of radioactive gas that’s not to be taken for granted! It can be extremely dangerous. Radon develops through the breakdown of naturally occurring uranium found in soil and rocks. Let General Home Inspection perform radon inspection and testing in your Cleveland Ohio home today. The gas is invisible, odorless, and tasteless, so it can only be detected with specialized equipment and testing. Radon often seeps into homes through ground-level openings, such as foundation cracks, sump pits, and small openings around pipes. ● Since radon is a radioactive material, it undergoes radioactive decay that forms decay products. 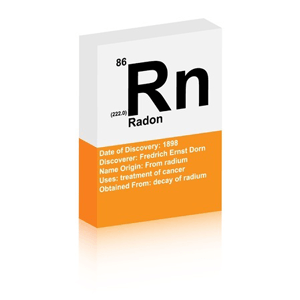 Both radon and its decay products then release radioactive energy that can damage lung tissue. Your risk of eventually developing lung cancer increases the more radon you are exposed to and the longer your exposure time. In fact, as the second-leading cause of lung cancer in the United States, radon exposure results in 21,000 deaths per year. ● As a result, the United States Environmental Protection Agency (EPA) and the Surgeon General of the United States recommends that all home owners schedule a radon inspection and mitigation service for your Cleveland area home. Thankfully, checking your home for radon is easy with a state-of-the-art test from General Home Inspection. If you do have levels of radon, repairs can be made at a reasonable cost. Investing in a radon test will give you peace of mind that you and your family are safe from radon exposure.